People usually say with sadness that Summer is over, even when it is more or less the same temperature! The high of Summer has given way to the pause of Late Summer. It is that pause between the rising Elements of Wood and Fire and the descending Elements, Metal and Water. 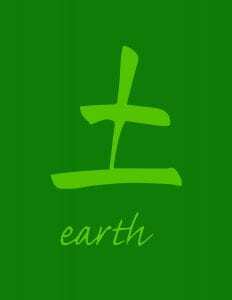 It is the energy of Earth - Mother Earth. Late Summer is time of harvest, a time of plenty, of reaping what we have worked for throughout the year. The plants and animals have grown and produced the fruit of their labour. If our Earth is of good quality, like quality soil, we will have the ability to produce good food to nourish ourselves. The Earth is about our feelings of stability. Think of the archetype of an Earth Mother - giving nourishing milk, having an abundance of compassion and care for its young, helping its young feel safe and protected, and giving them space to grow. The Spleen - "The Official of Distribution" enables us to move Qi to each cell as it needs, to know that sustenance will be where we need it. Out of balance it can exibit in worry and over concern.The Stomach is the "Official of Rotting and Ripening." This is about our ability, to take things in, to nurture ourselves, to feel full and satisfied with the fruits of our harvest. The Stomach Meridian travels through the body from forehead to toe along 45 points. When the energy is running harmoniously there exists the grace of calm contentment. One feels nurtured, not too empty and not too full. It is easy for the body to digest food, and in turn, the body receives nutrients and functions optimally. Satisfaction blossoms in a state of well-being. The spleen, the organ of nurturance and bonding , has been called our “inner mother.” In Oriental medicine, it is the yin, feminine aspect of the earth element with a strong connec­tion to the ovaries and uterus. In the digestive process, pure nutrients from the stomach are sent to the spleen and transformed into blood. Next, the blood is filtered for bacteria and other debris, then sent to the lungs in the form of qi energy. Since the spleen is also a digestive meridian in partner­ship with the stomach, it is very sensitive to stress and food. In addition, it is frequently depleted and, when weak­ened, is easily drained by the other organs and meridian channels. Poor memory and concentration, frequent diarrhea, dry lips, malnutri­tion, and menstrual disorders are some of the consequences of imbalance. The spleen is especially vulnerable to dampness. How does one support this mother of all organs? Proper exercise can help assure its essential job of homeostasis and support its sacred role. For instance, leg squats will start moving the energy along the spleen meridian channel, part of which runs from the big toes up to the inner legs. The following exercise will be helpful for this: Stand with heels touching and toes outward to form a “V” shape. Next, touch the ground with your hands or fingers and begin to do squats. Start with 25 repetitions and practice every morning to get the circulation flowing. Another invaluable exercise is to lie on your back with your arms and legs pointing straight up; hold this position and stay as still as possible while you breathe deeply. Allow any pain you feel to “burn” through any blockages in the meridians. This practice regenerates the body and helps release its tension; it also builds awareness of the subtle energy within the body and thus within the miind. The spleen, being very susceptible to the mind, can heal with ease. The spleen’s essence is closely inter­twined with one’s true self, and the posi­tive thoughts, emotions, and transmis­sions of the refined mind have the capacity to heal any trauma that can dis­connect one from their highest health and destiny. My Qi Yoga classes and Meridian Exercises are very helpful in maintaining this equilibrium, as well as preventing and healing any imbalances. body with fists or palms, especially on the abdomen (Try: "Belly Drumming"). This brings down any fire energy in the head and dissipates heavy thoughts and emotions. With consistent tapping, energy blockages and dampness along the meridian channel dissolve easily. radiate digestive power to the stomach and clarity to the rest of the body. With perseverance, the fire below can begin to grow, the head and emotions to adopt a fluid quality, and the channels to flow freely. It is the sacred fire in the center of ones being that lends itself across all yoga traditions as being the source of strength and power. Once blockages are released and energy flows smoothly, our human nature yearns for deeper connection and then for meaning and purpose. It is important to note true transformation comes with greater change. Changing your habits and your outlook. Expanding your conscious awareness to solve the question of why you are here, and developing your skills and capacity on a trajectory of growth and comprehension. This is where the journey begins and the 5 Elements can be a reliable path and reflective gage.